FFPE or fixed formalin paraffin embedded is a method used to store tissue samples for extended duration by preserving the morphology and cellular details of the tissues. The formalin functions to paralyze cell metabolism while paraffin will then seal the tissue and reduce the rates of oxidation. Many tissue samples are now stored using the FFPE method. FFPE tissue blocks are an important source for drug discovery, biotech research, and retrospective genetic studies. Archives of FFPE tissue samples can be stored at ambient temperatures for decades and is now an invaluable source that enable retrospective studies to correlate their molecular findings, clinical outcome, and therapy. 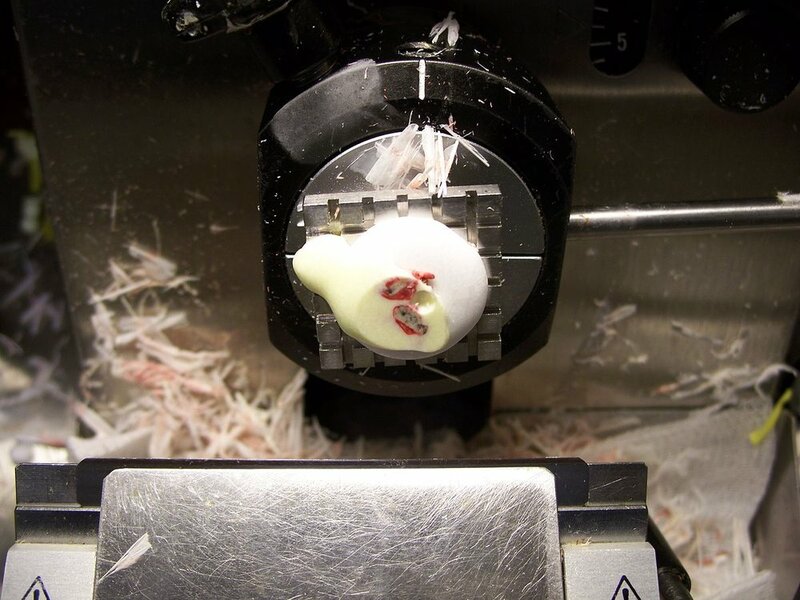 Since the samples are embedded in wax, it makes it easier to be cut into thin slices to be mounted on a microscope for examination purposes. FFPE tissues are now the commonest source of archived material. FFPE tissues are most frequently used in immunohistochemistry where tissue sections are mounted on a slide. It is then bathed in a solution that contains antibodies to allow it to bind to proteins and structures. To see the antibodies, stains can be used to show what and where the proteins can be found in the sample. This is important in studies of diseases such as cancer and Alzheimer’s disease. Therefore, FFPE tissues are especially crucial in the following fields: oncology, hematology, and immunology. When hospital pathologists study a biopsy obtained from a patient, some of the biopsy sample is archived for second opinions. Donated tissues from humans or collected samples from animals can also be preserved using the FFPE method and archived for later studies. These archives are also known as biobanks and can be developed in hospitals, universities, or companies that serve the research community. The collection of various materials has resulted in FFPE being a plentiful resource of research material as well as being able to offer a historical perspective. Since FFPE tissue samples are stored at ambient (room) temperatures, it is a cost-effective method as tissue samples do not need specialized equipment for storage. It also makes it possible to store a large collection that will remain viable for a long time. The formalin and wax ensure that cell structures and proteins are well preserved. Some of the disadvantages of FFPE are that the procedure involves the use of formalin which is toxic. The fixation and paraffin embedding process can also be time consuming. In studies that are using FFPE tissue samples, one of the disadvantages will be the non-standardized procedures in the preparation of FFPE samples which means that there are no assurances that selected samples are prepared the same way. The proteins in FFPE samples may be preserved but are denatured and no longer biologically active. This limits the use of FFPE tissue samples to certain studies only. FFPE samples cannot be used in molecular analysis as the results obtained are not on par when compared to results from frozen tissue samples. Frozen tissues are advantageous in the ways where the process is much quicker compared to the FFPE process. The procedure is rapid and used to fix and mount samples using a device called cryostat. It is used in many surgeries that involve the removal of tumors to determine if the tumor has been completely removed by studying the margins. While FFPE tissue samples are not suitable for molecular genetic analysis, frozen samples are well suited for it. This is due to the preparation of FFPE samples that affect molecular data. Frozen tissue samples are also preferred in analyses such as mass spectrometry, next generation sequencing, western blotting for post translational protein modifications, and quantitative real time polymerase chain reaction. Hence, frozen tissue samples are the gold standard for DNA and RNA sequencing especially when the strands must be longer than 50 pairs. In immunohistochemistry, frozen tissue samples are also useful as the proteins are still preserved in their native state. Some of the disadvantages of frozen tissue samples are the rapid deterioration rate of the samples once it is in room temperature. The sample will need to be frozen as soon as the sample is collected. This can be difficult as this means that the equipment needed to freeze the tissues obtained will have to be close to the site of surgery. Storage can also be expensive as it requires the samples to be kept frozen. This lowers the cost efficiency as specialized equipment (ultra-low temperature freezer) and storage is required to maintain the viability of frozen tissue samples. This means that the tissues are vulnerable in situations where there are power outages and mechanical failures. Since it is a newer method used in the preservation of tissue, this also means that biobanks usually have a smaller collection of frozen tissue.